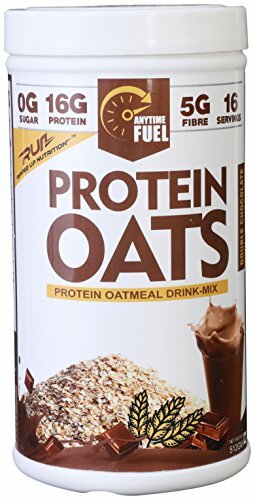 Ripped Up Nutrition (RUN) Protein Oatmeal Drink is another innovative offering from the brand. 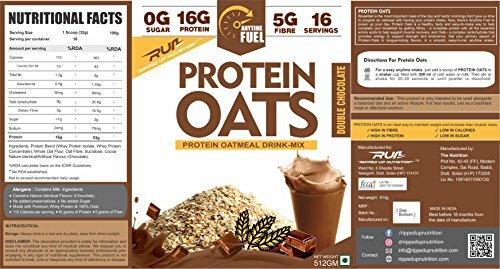 As the name suggests, it is designed to offer the goodness of oatmeal with the power of pure whey protein. It has been designed as a meal replacer to help people with their nutritional needs despite a busy schedule. Oats + Protein make for a delicious breakfast that is high on macros and super low on sugar and calories, offering a perfect start to your day. Each serving of RUN Protein Oatmeal Drink gives 16 grams of pure whey protein and 5 grams of fibre. It is a delicious and a convenient way to get your macros anytime, anywhere. Fibre: Oats is renowned for being a rich source of healthy complex carbs. Each serving gives you an impressive 5 grams of fibre to improve your digestion and keep you full for longer. The product label states that it does not have any added sugar (table sugar) or preservatives. 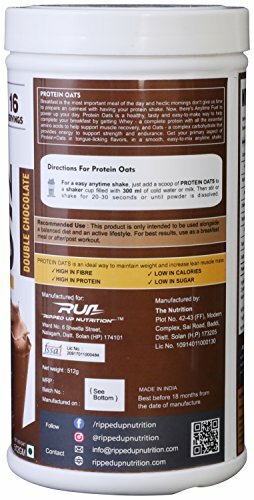 Ripped Up Nutrition Protein Oatmeal Drink is available in Double Chocolate flavour. The easy to mix powder gives you a delicious chocolaty shake loaded with the goodness of oats and protein. Users have responded positively towards its taste. The product has been designed to act as a breakfast replacer and it can do a pretty decent job at that. 16 grams of protein and 5 grams of fibre start your day in a super nutritious way. The product will definitely help you to meet your daily nutritional needs without loading you up with unwanted calories and sugars. It also keeps you full for long. Not just breakfast, it can also be consumed as a healthy snack option. It does not have any added advantage of BCAA, EAA or Glutamine and hence, we don’t see it being effective as a pre or post workout meal. Also, a single serving is not sufficient to meet the bodybuilding requirements and multiple servings might not be economical. However, even for bodybuilding enthusiasts who need to strictly monitor their protein and calorie intake, this product is a great snack to rely on. As a buyer, you can ask for any lab reports from the company to evaluate the nutritional claims before making the buying decision. You can also throw any product related questions at them through their website. Ripped Up Nutrition utilizes only FSSAI approved ingredients for their products for an assured quality. There seems to be no side effects reported for Ripped Up Nutrition Protein Oatmeal Drink. Even RUN’s official website does not mention any side effects associated with the product. However, the product has milk sourced ingredients (whey) and people with lactose and milk intolerance should use with caution. Overall the product seems to be safe. It is available in one pack size of 512 grams. Each jar has 16 servings (one serving is 32 grams) and comes for around Rs. 1500. Thus, the cost per serving comes to around Rs. 93 which is super expensive. This therefore, comes across as ‘premium priced’ and a lot of health enthusiasts might not be able to go for it in spite of liking the product. If you are planning to use it as a post workout meal, you might need more than one scoop as 16 grams of protein will not be enough. You would be spending close to Rs. 180 solely on one time supplementation. This is quite a big amount and might not be affordable for a lot of athletes. 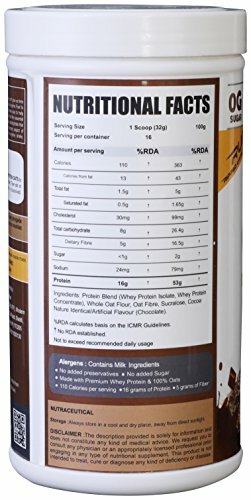 Ripped Up Nutrition Protein Oatmeal Drink is a promising product that is unfortunately a bit expensive. It is a meal replacer formulated for people who tend to skip breakfasts due to lack of time and opt for unhealthy snacks during the day. With 16 grams of pure whey blend and 5 grams of fibre in each serving, it definitely boosts the macros intake. However, a heavy price tag might not let it come across as a people’s product. Indian market needs innovative products but they need to be pocket friendly too. We would rate this product as GOOD.